What is the history of Logistics and Supply Chain Management? In this article, we will show you the true meaning of these terms that you've never heard before. What Do We Know about the History of Logistics and Supply Chain? According to the article by Lummas and team in 2001, the word "Logistics" in English appeared in the article as early as in 1898. 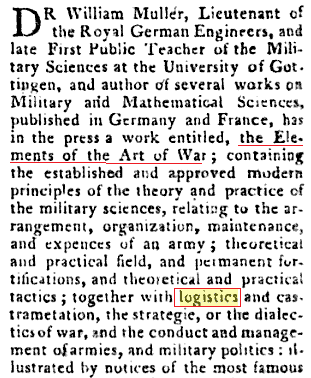 Lots and lots of articles point to the fact that the history of logistics is from the French word "Logistique" which first appeared in the book "The Art of War" in 1838 by Baron Henri de Jomini who was the general in the French army during Napoleon's time. The article by Frankel and team in 2008 indicated that "supply chain" and "supply chain management" first recognized in the 1980s. The article by Stock in 2009 said more specific that most researchers believed the term "supply chain management" was introduced by Keith Oliver of Booz Allan Hamilton in 1982 on the Financial Times. The history of logistics began in January 1810 on the "Scots Magazine, and Edinburgh Literary Miscellany for January 1810". On page 286, it said that Dr. William Muller, who was the first public instructor of military science at the University of Gottingen, planned to launch the book named "The Elements of the Art of War". It was here that the word "Logistics" in the English language appeared for the first time. 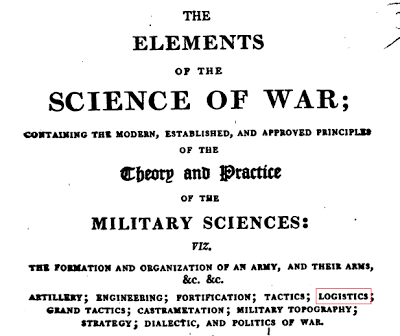 Later, Muller changed his mind and called the book "The Elements of the Science of War" in 1811. This book covered the tactics for Infantry (foot soldiers), Cavalry (soldiers on horseback), Artillery (soldiers with heavy weapons) and Pontonier (soldiers in charge of the construction of bridges). Muller explained in a very comprehensive manner about how "movement" of each type of soldiers should be done, which included marching, transportation, wheeling, advancing, formation, transport of heavy guns, how to cross the river etc. Since the publisher of this article is not part of the Google Books Project, only this screenshot is available for viewing. Anyway, the term "fortified pass" is a military term and this sentence was more likely to describe a war situation. The basic idea is that troops traveled to a battlefield and en route there were many "supply chain" (resupply points). Here at resupply points, inventory was stored for up to 8 days. 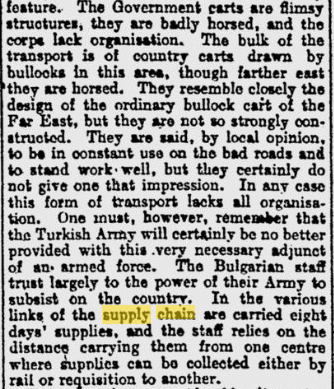 The phrase "the staff (Bulgarian) relies on the distance carrying them (supplies) from one centre... to another" is a bit tricky. According to the Free Dictionary, "distance" can also mean "the extent of progress". This implies that the army relied on "replenishment progress (process). 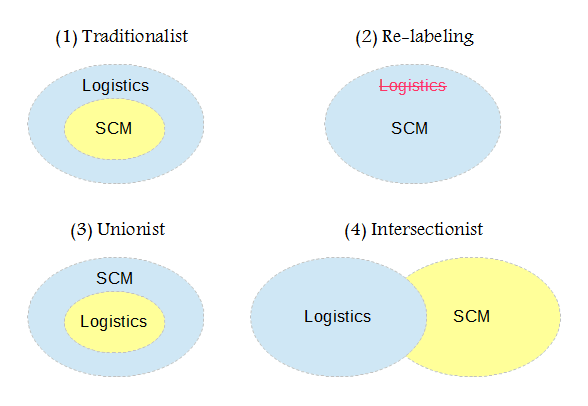 - Traditionalist: practitioners with the traditional view sees SCM as part of logistics. - Re-labeling: the job title "logistics analyst" will become "supply chain analyst" if companies feel SCM is the new term for logistics. - Unionist: many researchers believe that SCM is an inter-organizational process/collaboration, while logistics is within the corporate function. - Intersectionist: many practitioners feel both terms are 2 different things with some overlapping scope. - Both "logistics" and "supply chain" share the same root in military operations (not one from the military and the other from industrial or manufacturing context). 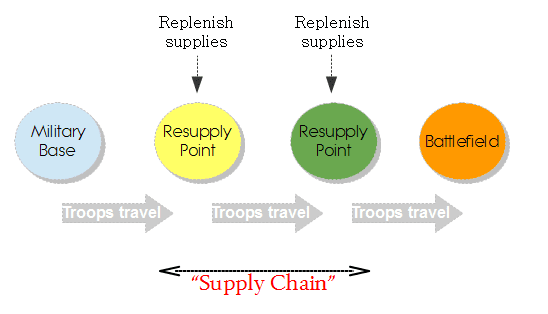 - Logistics implies the movement of troops and Supply Chain implies the resupply points in military operations. - Then, both terms can't live without one another. Imagine bread without butter, nuts without bolts or Tom without Jerry, what it's going to be? - Supply Chain doesn't have to be the only inter-organizational issue. It can be any point within the same organization. I would like to take this opportunity to express my appreciation for Google Books and Google News who spent its resources to digitize valuable books/news archives. Also, it won't be possible without the vision of the Harvard University Library, Raymond A. Whitwer Tilden Public Library in Nebraska and Library of Pennsylvania State University who preserve the books (Scots Magazine, and Edinburgh Literary Miscellany for January 1810, The Elements of the Science of War and The Independent Volume 58). Do you think this is the right version of the history of logistics and supply chain? - Jomini, A. H. (1838). Summary of the Art of War. JD Hittle övers.). I: Roots of Strategy Book, 2. - Frankel, R., Bolumole, Y. A., Eltantawy, R. A., Paulraj, A., & Gundlach, G. T. (2008). The domain and scope of SCM's foundational disciplines—insights and issues to advance research. Journal of Business Logistics, 29(1), 1-30. - Stock, J. R. (2009). A research view of supply chain management: Developments and topics for exploration. Orion, 25(2). - Larson, P. D., Poist, R. F., & Halldórsson, Á. (2007). Perspectives on logistics vs. SCM: a survey of SCM professionals. Journal of Business Logistics, 28(1), 1-24.